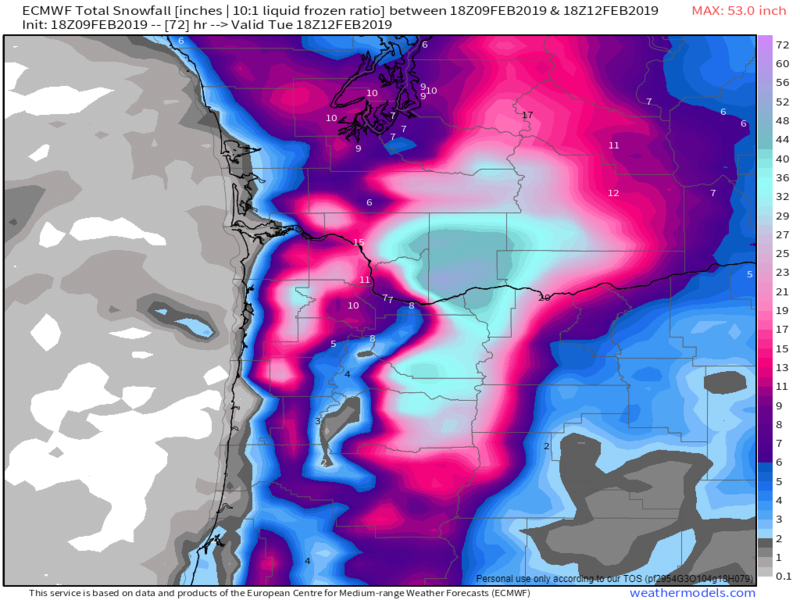 More context for Portlanders and that 18z Euro run. 3 maps below each centered at 10AM Sunday, Monday, and Tuesday respectively. By 10AM Tuesday, the snow has ended down there. Hard to tell due to limited available maps if that's because it changes over to rain or precip dries up. PDX temps at 10AM Tuesday are in the mid 30s. The 18z Euro increased snowfall from the second low. I'm trying to learn here but what's causing the snow shadow? 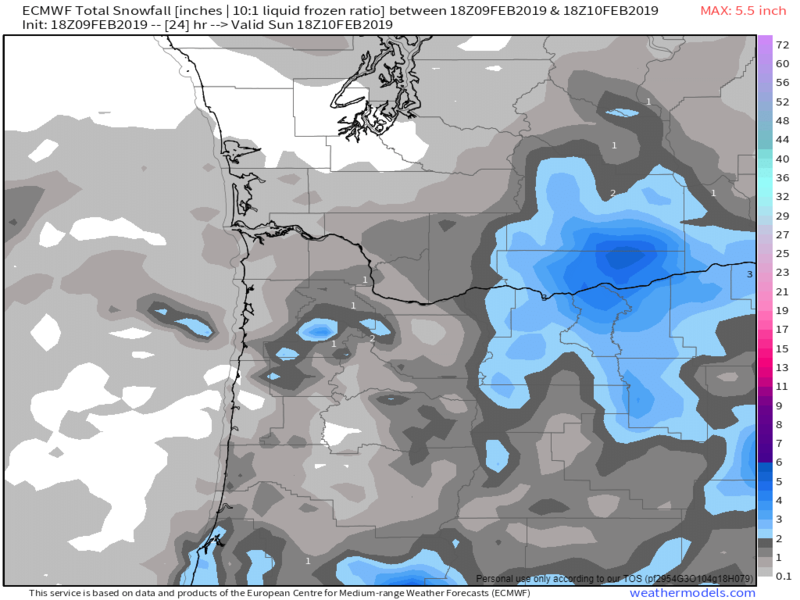 I could see places at a 1000ft or maybe lower getting some initial accumulations but the SW flow will eventually raise the snow level to 3000ft for at least some time if we are to believe the 18z GFS. GFS has 925mb temps going above freezing for a considerable period. Monday system has a little flavor of 12/20/2008 to it. Heavy snow, possible warming like in 2008, but in 2008 it went from snow to freezing rain, back to snow and cold. I remember it clearly as I drove up to Seattle on 12/20 while it was dumping for the Seahawks game the next day against the Jets. At least we were able to get some slightly below normal temps in the south valley. Would like to add to the humongous 0.2” that Springfield has had so far but I have my doubts. Never move to the south valley if you like snow. Glad you found a mission. Been a few days! Another beautiful snowy evening on the ranch. 12/20/2008 was absolutely beautiful for Portland too, and was far more region-wide. This is a Puget Sound special (and SW Washington too, I guess). I was only speaking for my area. Olympics. Much like traditional rain storms around here with their trajectory shadowing Sequim. Based on that trajectory of the low that was shown, the sound would be shadowed. Sorry, this one still stings. Yeah, for your area it'll probably be good. Do you get freezing rain often out there? Only in these borderline setups and usually just briefly, thats why I said it only had a little 2008 flair to it, it's nowhere near exact but the feel of the situation is similar. Hoping this next system pulls through for Whatcom Co! It's still cold as s**t here in Bham and plenty of ice and snow from last week caked on some surfaces. Another couple inches would be great. I was up at Mount Baker this afternoon and it wasn't nearly as gusty as it was in town. Just had the offshore flow finally kick in! Winds kicked out of the north about 20mph with a heavy snow shower. Picked up another 1.8" of snow in about 45 minutes. Up to 7.8" total with this event. 5.3" since midnight. Only place that missed out on that was EUG. I think some are putting a little emphasis, imagined or not - that the warm nose on this will be a bit much. Looks like a band of snow is developing in Central Marion County on a Silverton/Keizer line. 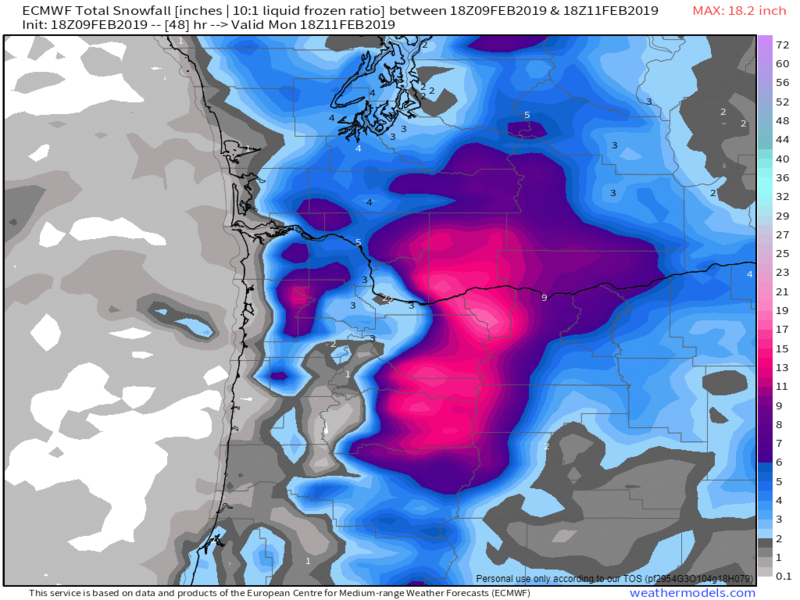 I see the 18z euro is as drunk as the 18z gfs for valley snow the next couple of days. I'd be shocked if any significant snow fell south of Battle Ground. 2 inches tops before the week long 37 degree rain. Agreed, but there is alot of variables in place which will cause anxiety for some, I am currently very pleased with things, anymore fun will be a bonus for my particular locale at this point. Still gonna root for the frozen precip!! It's about as perfect a track as we could hope for with such a system. It's small though so tiny shifts could have a big impact on snowfall. That said, this looks like a more traditional snow maker in this area than what happened on Friday (the low coming ashore rather than racing offshore). I'm also feeling pretty optimistic about the Monday system. Those north moving warm front/overrunners almost always bring a good snowfall here. That one could easily produce 4-6" and has way more room for error. The difference is that this time there likely won't a major warmup/changeover once it passes. I-5 turning white in North Salem per cams. 00z 3km NAM is a VI and Whatcom special for tomorrow night's system. Confirmed with my Dad he's getting sticking snow down in Silverton now. 00Z NAM agrees well with the 12Z ECMWF through Tuesday. Looks like heavy snow falling in North Salem and Keizer now per cams. Yeah driving south thru Salem was def starting to get snowy. Boring in the s valley as usual now. LocationBellingham, WA - 177 ft. I'll have the Whatcom special please. Anyone have any predictions on what the deformation band up north will do? 12z euro had it making it down here but the HRRR and NAM took it away. Band is still there and seems to be rotating slowly SW. We'll see if it survives. My Dad says its stopped at his house for now He got 1", completely covered even the roads. He said he had to go into Silverton and it looked like 2"+ there. Is he low elevation or on some kind of a hill? I wonder if it’s snowing silverton? The 0z RGEM continues to look good for the south island - Bellingham - Vancouver tomorrow. It hasn't changed much between runs. The GFS seems to be the primary holdout in taking things further north, though it shifted a little in recent runs. Will be interesting to see what the 0z shows. Radar pic of the snow band setting up across Marion County right now. I believe its being caused by low level convergence associated with the shift to offshore flow. Valley floor. Which is about 200' down here. The 0z RGEM continues to look good for the south island - Bellingham - Vancouver tomorrow. It hasn't changed much between runs. It almost looks like rain in a portion of town though. What do you think? Really strong east winds here in the West Hills. Wow. What radar site is that? It looks similar to the one DJ uses on Fb. Before we could head to the lake I had to borrow the neighbors tractor to make my steep driveway usable again! Temp dropping rapidly, down to 23.9 already. At the moment I would agree with Timmy in that that snow amount doesn't seem to fit the narrative being laid out. There won't be a supply of gorge outflow as I see it. Temps will be just warm enough for the valley floor to NOT see accumulating snow. Much like most areas today. That low would have to track at least to the mouth of the Columbia. That would be a big shift in the models. Could happen I suppose. Even a hint of southerlies will be the kiss of death for areas at the valley floor even just south of the metro, south metro south. Look what the southerlies did for most areas overnight. It could be close to greatness but right now I see it as a lot of cold rain going into Monday below maybe 1K. These snow maps have been pretty consistent though and has made it very confusing. I'm talking about them being opposed to the GFS mostly. The Euro snow maps are in opposition to the GFS low staying north. There may be enough cold air initially Sunday for it to be all snow but without a gorge outflow, I can't see it sustaining all snow going forward. If the low does indeed shift far enough south, all bets are back on for something good locally. Without gorge outflow, I can't see snow being sustainable.